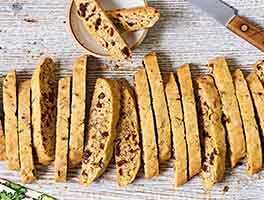 Biscotti look like a challenge to bake, but if you can shape a meatloaf and slice a loaf of bread, you've got all the skills you need to make delicious, gorgeous biscotti. This version, very mildly scented with lemon and almond, is perfect for summer. Ideal alongside fresh fruit, they're also wonderful crumbled and layered with whipped cream (or flavored mousse) and berries, for a splashier, dinner-party type dessert. *3/4 teaspoon will give you the merest hint of almond; if you're fond of that flavor, use the greater amount of extract. *No lemon juice powder? Substitute fresh lemon juice for some of the milk, to taste. Scrape the dough onto the prepared baking sheet. Shape it into a log that's about 13" long x 3" wide x 3/4" thick. Straighten the log, and smooth its top and sides; a wet spatula or wet bowl scraper works well here. Bake the dough for 25 minutes. Remove it from the oven, and allow it to cool on the pan anywhere from 10 to 25 minutes; just work it into the schedule of whatever else you're doing in the kitchen. Reduce the oven heat to 325°F. Wait another 5 minutes, then use a serrated knife to cut the log crosswise into 1/2" slices. As you're slicing, be sure to cut straight up and down, perpendicular to the pan; if you cut unevenly, biscotti may be thicker at the top than the bottom, and they'll topple over during their second bake. 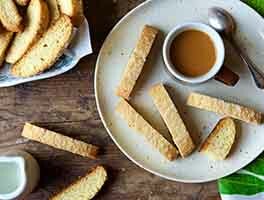 To make glazed biscotti: Combine the confectioners' or glazing sugar with the lemon juice powder and milk; drizzle over cooled biscotti. This is a delicate biscotti which I served with berries and vanilla ice cream. 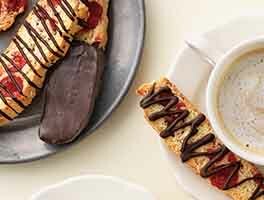 It was very good and different from the denser biscotti I usually make. 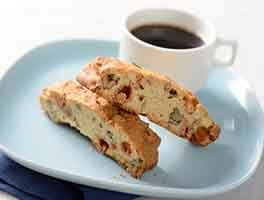 I love biscotti, and have made many different recipes, and this one, which sounded delicious, was very disappointing. The recipe, which I followed exactly and used the largest amount of flavorings, was not bad. It just was not particularly good, but was bland and just okay. I did not add the icing, because I don,t particularly care for it. I didn't dislike these cookies, but I probably wouldn't bother to make them again. I made this recipe using King Arthur Flour Measure for Measure so they are gluten free! The texture and taste is delicious and doesn't have that aftertaste often found in GF products. This flour is great!! I decided to use almond milk and lemon juice in the glaze - they look AND taste amazing!!! Made a double batch and will freeze most. Yet another successful recipe from KAF! Absolutely perfect, with the right amount of crunch and flavor. Thank you KAF, your website is my go-to baking site and I'm yet to have a failure. I made these following the recipe exactly with the addition of toasted almonds. 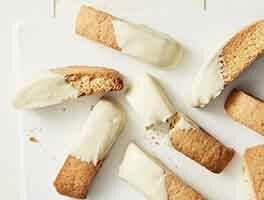 We loved the texture finding the biscotti to be crisp but not rocklike as with some recipes. Loved the glaze. I will definitely make these again. I made these for Christmas and they were delicious! Next time I am going to use less almond extract and more lemon. 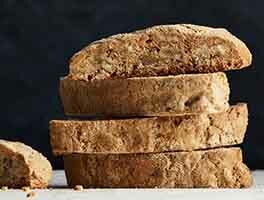 I love biscotti anyway but I don't like them when they are really hard to bite into and these have just the right amount of crunch without breaking your teeth. I made these for a friend who loves lemon. She ate them in 1 day. I did up the lemon by adding more rind and cut back on the sugar, just a bit. They were delicate and very delicious. Will make for holidays! Love this recipe! Easy and turns out perfectly every time, I do use the maximum amounts of almond extract and lemon zest and juice and use juice in the glaze and sprinkle chopped almonds on the glaze. Just finished a second recipe for a wedding cookie table (it is a Pittsburgh thing!). Light and perfect for summer coffee!